The scientists’ groundbreaking work on the immune system has paved the way for a new class of cancer drugs that are already dramatically changing outcomes for patients. It is the first time the development of a cancer therapy has been recognised with a Nobel prize. Allison said he was in a “state of shock” about having achieved “every scientist’s dream”. “I’d like to give a shout out to all the [cancer] patients out there to let them know we’re making progress here,” he said. “I’m a basic scientist. I didn’t get into these studies to cure cancer, I wanted to understand how T cells work,” said Allison. However, he added that a family history of cancer (his mother died of lymphoma when he was 10) and having witnessed the ravages of radiotherapy and chemotherapy meant he always had an eye on whether his work might lead to a new therapy. “It was always in the back of my mind,” he said. 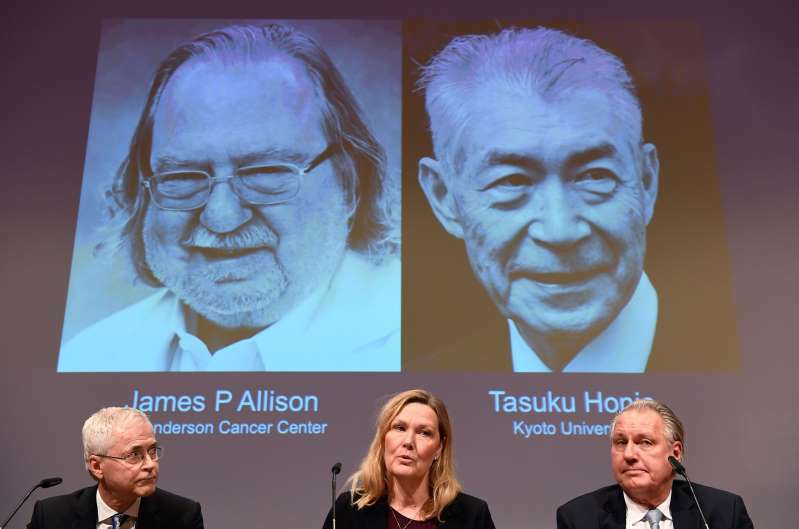 The Nobel assembly’s summary said Allison, who is professor and chair of immunology at the University of Texas’s MD Anderson Cancer Center, “studied a known protein that functions as a brake on the immune system. He realised the potential of releasing the brake and thereby unleashing our immune cells to attack tumours. He then developed this concept into a new approach for treating patients. Quezada describes his former boss, who is in a blues band called The Checkmates, as “an awesome guy, humble, a fantastic mentor … and an insane harmonica player”.